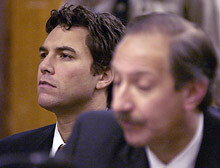 Scott Peterson listens during his arraignment Wednesday. MODESTO, California (CNN) -- Scott Peterson denied Wednesday that he killed his wife, Laci, and their unborn child. "I am innocent," Peterson told the judge at his arraignment. It was his second claim of innocence, having denied the accusations after his arrest in April. He appeared thinner after spending nearly seven months behind bars. Stanislaus County Superior Court Judge Al Girolami set a trial date of January 26. But pretrial hearings on defense motions for a change of venue and to dismiss the charges could delay the trial's start. Mark Geragos, Peterson's high-profile defense attorney, contends that massive pretrial publicity in Modesto -- where the couple lived and where numerous residents participated in searches and vigils after Laci Peterson's disappearance -- would influence potential jurors. Laci Peterson, 27, was last heard from last Christmas Eve. She was eight months pregnant. Scott Peterson, 31, a fertilizer salesman, told police he left to go fishing that morning and she was not there when he returned late that afternoon. In April, the bodies of Laci Peterson and the couple's unborn son washed up on the eastern shore of San Francisco Bay, just miles from where Scott Peterson said he had been fishing. He was arrested days later in San Diego and brought back to Modesto to face murder charges. In other matters Wednesday, Girolami left in place a gag order preventing participants from talking to the media, and he said autopsy photos would remain sealed. Charity Kenyon, an attorney representing five California newspapers, had asked for the evidence to be unsealed, arguing that since it was used in a preliminary hearing in the case, it is now part of the court record, which should be opened to the public. Both the prosecution and defense objected, particularly to giving the media access to the autopsy photos. "This is this man's wife and his baby, and they're gruesome photos," Geragos said. "I don't understand what macabre fascination anybody would have to want to see these things and have them seared into their brain and what possible purpose it would serve." Kenyon said the newspapers did not intend to publish the photos, and she was not even sure that anyone would actually want to look at them. But she argued that on principle state law requires access to them. Girolami disagreed, saying there is "considerable overriding interest" in keeping them sealed because of the damage their release could do to the victims' families. The judge also ordered prosecutors to return nearly $15,000 seized from Peterson when he was arrested and his Ford F-150 pickup truck seized by authorities. Outside of court, Jackie Peterson, Scott Peterson's mother, said she did not consider the ruling a victory. "When my son walks out the door, I'll consider that truth and fairness and what should be happening in America," she said. Jackie Peterson was also asked whether the family was concerned that Geragos is simultaneously representing pop star Michael Jackson on child molestation. "We think he's great, and we are comfortable with whatever he does," she said. Geragos had also wanted the judge to modify the protective order preventing parties in the case from talking, saying he wanted to have a "safe harbor provision" that would allow statements to be issued to refute erroneous information in media reports. He said that would allow both the defense and the prosecution "to try to stick a fork in some completely unfounded rumor or some piece of information that all of a sudden morphs into an urban legend." Prosecutors objected to lifting the order. Girolami agreed, saying it has been effective and that publicity surrounding the case has not abated. The next hearing in the case will be December 12, when Geragos will file a motion for a change of venue and prosecutors, who do not want the trial moved from Modesto, will present their plans for a jury survey to determine the effect of pretrial publicity. That motion will be assigned to another judge. Girolami has already ruled, after a 12-day preliminary hearing, that prosecutors had presented enough evidence to bind Peterson over for trial. Laci Peterson's disappearance set off a massive search that triggered nationwide media interest -- publicity that alerted a Fresno massage therapist named Amber Frey that her new boyfriend, Scott Peterson, had a missing wife in another city.